So it happened that I finally got fed up of the rice and beans breakfast I had been having in the office for the past 3 months. On the morning of September 13, I asked my colleague to help me get yam and plantain so my stomach could experience a difference in atmospheric conditions. He returned 10 minutes later and declared that no one was selling yam in the area. Apparently he had suffered a temporary amnesia else he would have remembered that you don’t report back on an assignment without results; you should always do WHATEVER IT TAKES to get it done. So it was that after allowing him to return my bowl to the store room in the office, I went to get the same bowl and secretly headed out of the office to seek for my loved & lost yam. The first place I stopped by happened to be one of the hottest food selling joints in Agidingbi. They were so much in demand that even though the attendants shout and scream at the hungry clients, the clients still keep coming back often with an apology for making “Mama Put” angry. The attendant told me categorically that there was no restaurant in the area that sells yam. Apparently the attendant must have descended from the same lineage as my colleague that I sent to help me acquire the asset earlier; they seemed to be speaking the same language. 40 minutes and 14 mini-restaurants later, I became frustrated that I could not find one canteen that sold yam. Perhaps what my colleague said was true. Perhaps no one was indeed selling yam in the area that morning. Perhaps this was an opportunity in disguise for me to start a yam-selling business and call it “eloYam Canteen” with the slogan “Delivering HOT YAM, YOUR WAY” (or something like that). Perhaps my belief in the phrase “Nothing is Impossible” was overrated. I decided not to give up. How will that make me look in front of my compatriots. That I do not practice what I preach. That going the extra mile will give you results beyond the average mind. I wasn’t about to give up. Approaching the 16th canteen, it would seem that all hope was lost. The canteen had finished selling all the food they had and they were busy washing the plates. It was just 10:20am. Maybe I should just settle for rice and stew since that’s what is available everywhere. Afterall, it wasn’t as if I saw it in a vision that if I don’t eat yam and plantain that morning, the wife of my youth will run away with my 2 princesses to marry Bill Gates teenage son. But I reluctantly decided to try one more time. It was then I noticed another “undercover” canteen just 2 buildings from where I was standing. I had passed that building over 10 times in the last year and did not know that it housed a canteen. I asked the woman washing plates outside if they had yam. “Go inside and buy it” was her response and I was almost doubting she heard me correctly. I thought no one sold yam in the entire area. I asked her again and she blurted “Go INSIDE”. Entering through the doorway that was only wide enough to allow one slim person enter per time, I met a crowd of about 8 people waiting to get their portion of dream food. After waiting for about 2 minutes, I decided I did not want to waste my time to queue up for 15 minutes only to discover they didn’t sell yam. So I just shouted to the women selling the food “Is there Yam?” A mixture of doubt, surprise, fulfillment and happiness enveloped my soul when she replied in the affirmative. 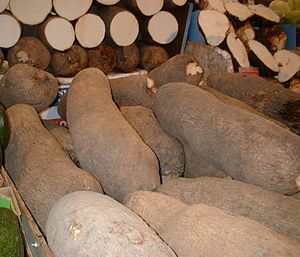 Finally I FOUND YAM. Finally YAM FOUND ME. You should have seen my facial expression when the attendant opened the pot of boiled yam and began serving me my portion of destiny-fulfilling yams. I was elated. So elated that I decided to spend the entire N180 I brought to give myself a yam and plantain treat (normally, I wouldn’t have spent more than N100). Funny enough, if the person in front of me had ordered N200 worth of yam, the canteen would have run out of yam to sell consequently making me to relocate to my yam-filled village of Abeokuta. Thank God there was still yam for my soul. Getting back to the office, I narrated my ordeal in search of the long lost yam. It seemed quite weird to some of my colleagues but I think the message was successfully passed across: DON’T TELL ME SOMETHING IS IMPOSSIBLE or UNACHIEVABLE. Infact, if anyone working with or for me strongly believes that its not possible for them to do what I ask of them, that might be the last time we work together. I’ve learnt in my few years of experimenting as an entrepreneur that whatever you put your mind to do or achieve will come to pass if you’re persistent and especially if God is working with you. So except it is the JAMB exams you’ve unsuccessfully passed in the last 16 years, never give up at trying until you’ve tried 17 TIMES. That’s my new motto. That’s my renewed way of thinking. Anyone up for some yam?